The Ooma Motion Sensor detects unexpected activity. Want to know when there’s a critter in the garage or someone hanging out in your man cave? The motion sensor lets you know whenever motion activity is happening around the area it is monitoring. Detects unexpected motion activity, even in the dark. Receive alerts via app notifications, phone, text, email, and Telo voice announcements. Has an 85-degree field of view and a range of up to 35 ft. (up to 900 square ft. of coverage). Comes with a CR123A battery (approximately 1.5 year battery life), optional standing attachment, adhesive pads, mounting screws and drywall anchors. The Ooma Motion Sensor works with the Ooma Home Security Mobile App to alert you of any unexpected movement in your home. Perfect for use in hallways, large rooms and even your garage, the Ooma Motion Sensor can detect motion or the lack thereof, even in the dark. It can also be mounted on the wall or with the included stand, giving you plenty of flexibility with your home security setup. What comes with the Motion Sensor package? How do I install the Motion Sensor? The first time you set up the Motion Sensor, you will need to pair it with your Ooma Telo. If you’re a first-time Ooma Telo customer, you can find out more about setting up your Ooma account by clicking here. Use the Ooma Home Security Mobile App to press the “Add Sensor” button on the dashboard. Adhesive tape installation: To install the Motion Sensor on the wall with the included adhesive tape, start by wiping the surface with a damp cloth to clean it. Dry the surface, and then peel the adhesive tape. Press one side of the tape to the sensor, and then press the sensor against the wall and hold it in place for 30 seconds. Screw and drywall anchor installation: To install the Motion Sensor in drywall, start by using the mounting plate as a template to drill four holes that resemble the size of the included drywall anchor. Push the drywall anchors into the holes, and then screw the mounting plate into place. Reattach the sensor to the mounting plate. Screw installation: To screw the sensor into a non-drywall surface, screw the mounting plate into the wall in the desired location. Reattach the sensor to the mounting plate. Mount installation: You can place the Motion Sensor on any steady surface by mounting it into the included stand attachment. This installation method does not require adhesive pads or screws. The Motion Sensor is not weatherproof, so it should be mounted indoors in a dry location. If you are interested in outdoor home security protection, check out the Ooma Smart Cam, our 100 % weatherproof and wireless security camera. The wireless signal between the Motion Sensor and Telo can be blocked by metals, so avoid mounting it on a metal surface such as a refrigerator or water heater. What is the battery life of the Motion Sensor? The Motion Sensor has an approximate battery life of 1.5 years. You will receive a notification immediately when a sensor has low battery life. In addition, you will receive notifications via the app every Wednesday and Saturday until the battery is replaced. The Motion Sensor is designed to be battery-powered so that it can be installed anywhere. Yes. The Motion Sensor uses infrared technology to detect movement in the dark. The Motion Sensor has a field of view of approximately 85 degrees. The Motion Sensor can sense movement up to 30-35 feet away, for a total coverage area between 670 and 900 square feet. Can the Motion Sensor ignore pet movement? Currently, no. The Motion Sensor can be triggered by the movement of household pets. However, releasing an update to account for pets is on our roadmap. What are my enabling options for the Motion Sensor? You can use the Ooma home security mobile app to determine when the Motion Sensor is enabled and when it is not. The app can also be configured to alert you when motion has not been detected for a certain amount of time. This can be useful if you are expecting someone in your home at a particular time. You can learn more about the Ooma Mobile App by visiting the app’s FAQ page. Make sure that the placement of your sensor encourages a better signal. 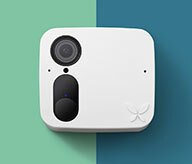 Your sensor must be within 200 feet of your Telo to maintain a good connection. Avoid mounting your sensor near metal objects, which can obstruct the signal between your sensor and Telo. Check on the battery life of your sensor. Quickly tap the sensor’s pairing button. If the LED status indicator shows a solid, steady light for 5 seconds, your battery is in good shape. If it blinks for 5 seconds or does not light up at all, you will need to replace your sensor’s batteries. After replacing the batteries, tap the pairing button to alert your Telo Base Station to reconnect. If the steps above do not resolve the issue, try re-pairing the Motion Sensor by pressing “+ Add Sensor” on the Ooma Home Security mobile app dashboard and choosing the type of sensor you want to re-pair. Follow the on-screen instructions. If none of these troubleshooting steps solve your issue, contact our Customer Care team. Check out this video to see how Ooma gives you a full home security setup with simple installation. 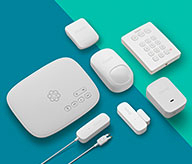 Watch this video to see how easy it is to set up Ooma’s Motion Sensor with a hassle-free DIY home security system installation on the Ooma Mobile App.